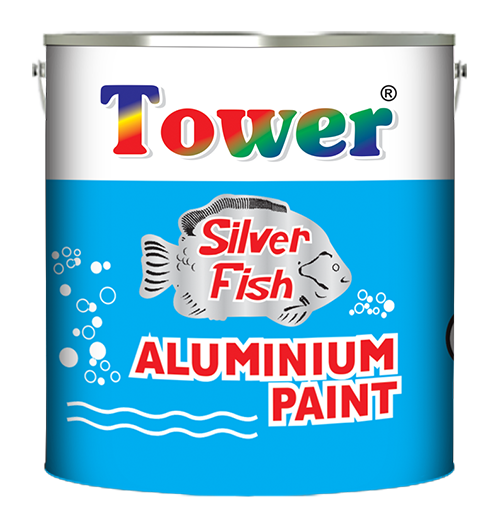 Tower Aluminium Paint is a silver paint with a high metallic luster which protects the surface from corrosion, discolorations and effects of mild heat. Typical use include chimneys, pipe lines, storage vessels, stream pipes, light poles, bridges, door and heat exchanges. Suitable for chimneys, pipe lines, storage vessels, stream pipes, light poles, bridges, door and heat exchanges. New, bare, old or previously painted surfaces must be clean, dry and free from wax, dust, rust and all unwanted material. Clean the surface by rubbing down with abrasive paper. Brush down previously painted surfaces and dust off. Apply Honey Gold red oxide primer on all metal surfaces in order to prevent from rust. Allow the Surfaces to dry completely. Stir paint thoroughly before use..